what the water says: Jackdaw, cat and us - how do animals think? I really don't know, of course. But I just watched a jackdaw arrive at our bird-table. As far as I know, and exceptionally smart though he is in birdland, he couldn't, with a brain that size, rationalise his situation. He couldn't think about it. He was simply and most effectively - in it. Lightning-fast (literally -we should say "electrically-fast") circuits were flashing through his entire system - eyes/brain/wings/legs. That much we do know. He was his situation, at one with it. 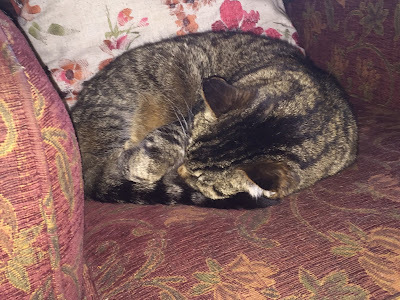 Then there's our cat. Super-adapted to his environment. Surely eligble for an award as the most spoiled, smug and contented cat in the UK. I can watch his behaviour patterns. Enter, pause, check armchairs, note a visitor in his favourite seat, sit at stranger's feet and glare at her - no good. Move to next favourite chair. Curl up. Sleep. But at the sound of a neighbouring cat at our cat-flap he will, with remarkable speed, pour himself silently across the room and out of the door to investigate.No pauses, no if or but. Sometimes experts try to make comparative measurements and pronounce that dogs are cleverer than horses (or vice versa) Maybe the real question is - how far is a creature a successful part of their environment? How far are we? New-born antelopes can get up and totter about almost at once, whereas babies take months just to stop their heads flopping about. But if the antelope's environment were to suddenly change, he'd swiftly become extinct. Humans are exceptionally adaptable, hence their lengthy infancy and childhood. Lots of neural connections and circuits to build, lots of different circumstances to adapt to. But we don't so much live in the moment as our cat and the jackdaws outside do. Humans seem to need Stuff, novelty, excitement, future dreams and past regrets. We can rationalise and analyse and compare things, we can act successfully on a huge number of varied sensory inputs from the world around us. Yet we seem to be altering our environment in ways that might soon leave us as bewildered and helpless as a baby antelope in downtown New York. Politics, science and technology are trying to find ways of diverting catastrophe. Maybe we also really badly need an inward revolution, one that helps us stay in the present, accept who we are, understand where we are and what's in front of us. 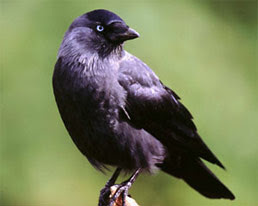 We need to be as sensitive to our environment and as in the present moment as the jackdaw. Life would be simpler and harder, more about essentials and less about distractions from distractions by distractions.